I tried using the blunt tip of my seam ripper to gently pull the stitches taut, one at a time, but even after I tightened the entire seam, it still looked awful. 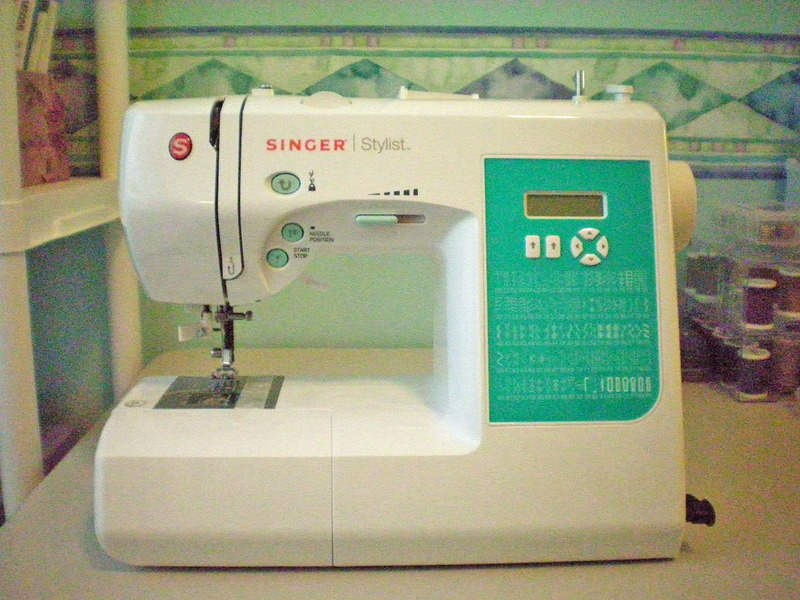 There was no use denying it—my precious sewing machine was gravely ill. I knew it was overdue for a tuneup. In nine years, I’d performed no maintenance beyond my weekly cleaning and oiling routine. But the machine had gone those nine years without so much as a hiccup. I did the research and found that a machine that skips stitches most likely needs the timing adjusted. This costs anywhere between $75 and $100. Since I only paid about $80 for my Brother XL-5130, I elected to retire it and upgrade to a new machine instead. It pained me to make such a decision. After all, the Brother XL and I had been through a lot together. 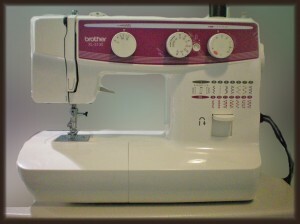 It was the first sewing machine I’d owned—all the others had been borrowed from my mother. My machine was like an old friend. But I think I made the right decision. And, after all, I can always decide to fix it up later and keep it as a backup sewing machine. 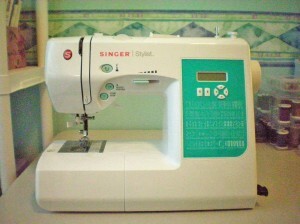 After doing some research, I decided on the Singer 7258 Stylist for my new sewing machine. It earned four and a half stars at Amazon.com and had plenty of five-star reviews. 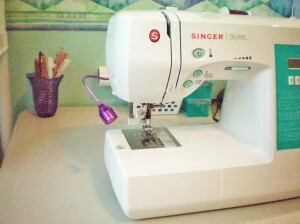 It has all the features I wanted—such as speed control, so you can adjust how fast or slow the machine sews. Some of my students are intimidated by how fast a sewing machine can go, so I specifically wanted something that would allow them to start off sewing slowly. Another appealing feature was the one-step buttonhole-maker. If I wasn’t already convinced, the ten different presser feet it came with pushed me over the edge. Best of all? I caught it on sale, so I got a great deal. At first, the new machine sewed very slowly and with a certain amount of resistance when I turned the hand wheel. I knew something was wrong and thought perhaps there was some packing material that had been left down in the bobbin case. I popped the bobbin spool out to take a look. As soon as I did that, something clicked and suddenly the hand wheel turned freely, with no resistance. I reassembled everything and it worked just fine. At first, I had trouble getting used to the computerized sewing. Not only are the stitches controlled electronically, but the sewing itself is, too. You press the foot pedal and it’s either on or off. There is no slow buildup as the engine engages. You can even eliminate the foot pedal entirely, if you like, and simply press a button to start and stop. I prefer the pedal, though. I like the automatic needle-up or needle-down button. You choose one or the other, and anytime you stop sewing, the needle will automatically stop in the up or down position, as you choose. Personally, I prefer having it stop with the needle down in the fabric. I also love the one-step automatic buttonhole feature. My old machine had a four-step buttonhole feature, which never worked properly. The buttonholes it made were thick and uneven, so I resorted to sewing my buttonholes by hand. The new machine makes gorgeous buttonholes in a matter of seconds. It’s fantastic! The only thing I dislike about the Stylist is that it doesn’t provide much light. Because it’s so dim, I ended up taking an LED clip-on book light and taping it to the back of the sewing machine, with the light angled so it shines where I need it. It isn’t much of an improvement, but at least it’s something. Overall, I’m pretty happy with my new machine. It has its quirks, but what machine doesn’t? What sewing machine do you use? What features do you like best? Does it have any quirks that you dislike? This entry was posted in Monday's Mish-Mash and tagged Monday. Bookmark the permalink. Comprei a minha porém só chegará em uns 8 dias, estou ansiosa. Costuro pouco mas com a vinda de um netinho ou netinha pretendo fazer muitas coisas lindas para o mesmo. Foi amor a primeira vista com essa maquina. Translation into English: Bought mine but only will arrive in 8 days, I’m anxious. Sew little but with the coming of a little grandson or granddaughter intend to make many beautiful things for the same. It was love at first sight with this machine. Reply: I’m glad you’ve bought a sewing machine! Try and find a teacher to help you learn to sew. Have fun making things for your new grandbaby! Muito obrigado! Essa tecnologia do mundo atual é impressionante, aqui estamos, tao distantes e com outro idioma e no entanto nos comunicando, isso é maravilhoso!